The core layer is the backbone of your entire network, so we’re interested in high-speed data transfer and very low latency. The core layer is the backbone of our network, so we’ve got to optimize data transport. We want our core switches to handle switching, and let distribution-layer switches handle routing. Advanced QoS is generally performed at the core layer. STP Root bridges should also be located in the core layer whenever possible. Distributed Per VLAN across each core. Smaller networks can use a collapsed core, where certain switches will perform both as distribution and core switches. The demands on switches at this layer are high. The access-layer switches are all going to have their uplinks connecting to these switches. The distribution layer is also where routing should take place when utilizing multilayer switches, since the access layer is busy with end users and we want the core layer to be concerned only with switching, not routing. The distribution layer also serves as the boundary for broadcasts and multicasts, thanks to the L3 devices found here. QoS can also exist at this layer. Traffic filtering and basic QoS. Switch blocks are units of access-layer and distribution-layer devices. Core blocks consist of the high-powered core switches, and these core blocks allow the switch blocks to communicate. We want the core switches to be left alone as much as possible so they can concentrate on what they do best – switch. 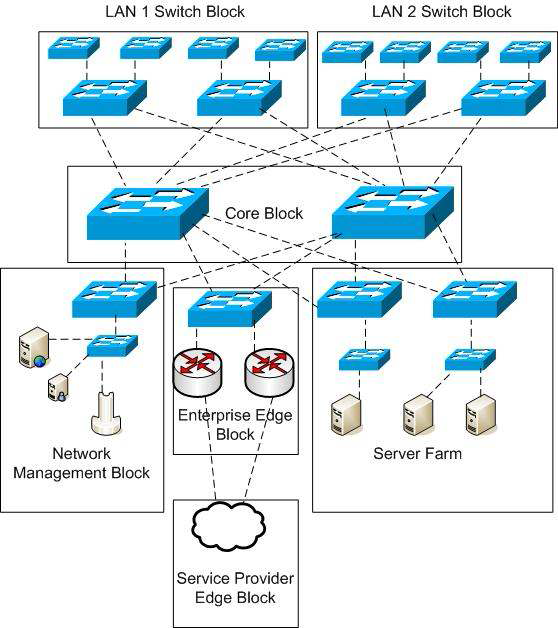 The Enterprise Composite Network Model uses the term block to describe the three layers of switches. Prepare. At this stage, we’re answering the musical questions “What is our final goal, what hardware do we need to get there, and how much is this going to cost?” The questions here are broad. Plan. You’re still asking questions, they’re just a bit different. “What does the client have now, can the current network support the network we want to have, and if so, what steps do we need to take to get there?” At this point, the questions are getting more specific. Implement. The design becomes a reality. Operate. The (hopefully) mundane day-to-day network operation.